A man who blew all his cash on a pile of drugs made life miserable for guests at a hotel after his binge came to a head. Kevin Doyle (32) used money he received from a family member to purchase drugs and this led to a fortnight of excess, which saw him wandering the streets thinking he was being followed and culminated in him kicking room doors and shouting and swearing at hotel guests in the early hours of the morning. 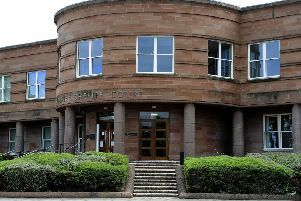 Appearing at Falkirk Sheriff Court on Thursday, Doyle pled guilty to threatening behaviour at the Richmond Park Hotel, Linlithgow Road, Bo’ness on November 11. Procurator fiscal depute Michael Maguire said: “The accused was a guest at the hotel and there were noises coming from his room at midnight. He agreed to go to bed after being spoken to. Neil Hay, defence solicitor, said: “He came into money from a family member and he burned the whole lot on drugs – he is absolutely candid on that. He had a two week period where he experienced harrowing thoughts and began walking the streets of Falkirk and Grangemouth, thinking he was being followed. Mr Hay added Doyle had been in and out of trouble with the court for a number of years and drugs were a major factor in that. Sentence was deferred until January 25 for a community payback order progress report and for good behaviour.